The Suffolk is number one for growth rate as confirmed by independent scientific studies. This ability to grow and finish quickly is essential. Suffolk lambs can be taken to heavier carcase weights. Increasing numbers of commercial producers now include Suffolk genetics in their ewe flocks as the breed has high milk output, hard hooves and wide pelvic dimensions for easy lambing. Society sales in England, Scotland and Wales and most of the Agricultural Shows are for MV accredited sheep only. Prospective members are therefore recommended to join the Maedi Visna Accrediation Scheme. This is run by the Sheep & Goat Health Schemes. David Hampson original owner of Greenslade Flock passed away in August 2014. David who was based at North Tawton started the flock in 1946 with 10 ewes and built it up over several years purchasing ewes from CJP Ball, A G Waspe, A Duke and J S Taylor. Scince then all replacements were home bred. 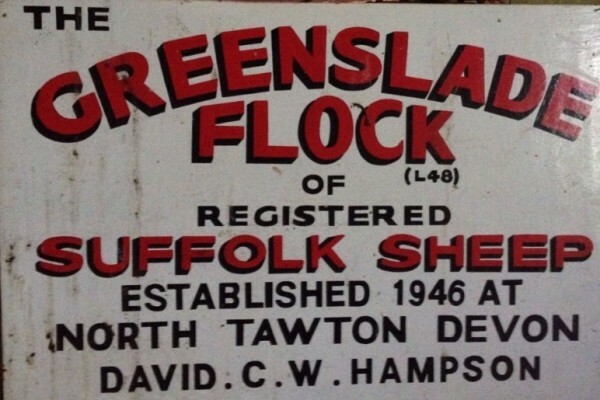 Today Greenslade Suffolk Flock is being run by Lorrain Ruby and Duncan Stephen who took over the flock from where David left off. This year the Greenslade Suffolk Flock produced 20 lambs. Today the Greenslade Suffolk Flock numbers are 4 rams 23 ewes and 20 lambs.